An image from a recent Rooted Fork Foodie Tours event. Rooted Fork Foodie Tours include food, local history, art and culture. Mecaela Miller is a dedicated foodie. If you doubt it, she’ll show you the small, tasteful tattoo of a fork on her forearm. The card for her business — Rooted Fork Foodie Tours— also has a drawing of a fork, this one stuck in ground with roots sprouting from the tines. The image has personal significance for Miller. The fork represents the 32-year-old Sacramento native’s passion for food, and the roots are emblematic of the sense of community she feels as a Napa resident and businesswoman. Food is playing an increasing role in the local economy. Visitors to Napa Valley spent a record $1.27 billion in the county in 2015, according to a recent economic impact report cited by visitnapavalley.com. The report indicates $331 million was spent on food service, an increase of 10 percent from 2014, second only to lodging at $355 million. Just as the number of wineries has exploded in the past few decades, so, too, has the number of eateries. In 1985, there were 12 restaurants in Napa, and today there are more than 80, according to an article last year in the North Bay Business Journal. Wine and food are now two sides of the same local coin. She landed a position at Round Pond winery as the estate liason. After in few years there, in 2012 she began her own event planning business, consulting for Napa and Sonoma wineries, and subsequently became operations and special events manager for Napa Valley Film Festival. She got in on the ground floor with the first BottleRock music festival as the wine program director for four years and last year as the spa director. All the while, Miller was aware of food as an expanding component of the Napa Valley experience. And while wine tastings were ubiquitous, she was struck by the absence of food tastings. “Everyone in Napa is doing wine and doing it very well. I wanted to offer something different than that,” Miller said she thought at the time. Using relationships built though her business and personal dining experience, she approached various local restaurants about Rooted Fork Foodie Tours and got enthusiastic responses. 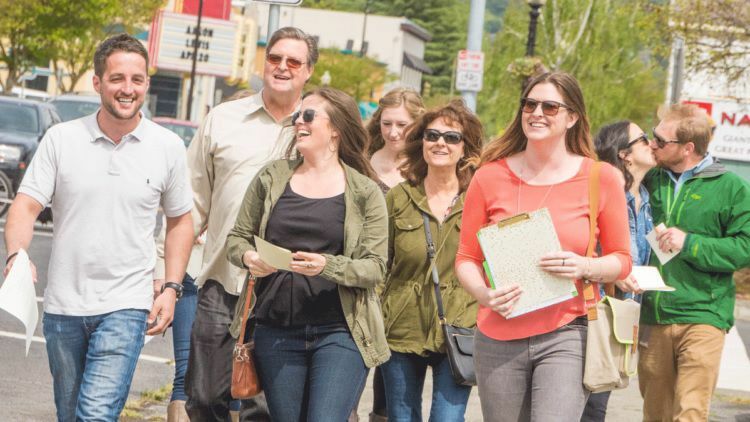 Starting in April, Miller began offering a walking tour at 2 p.m. Fridays that includes eight downtown Napa restaurants. Groups are limited to 10 or fewer to keep the experience intimate. Starting at Alexis Baking Company, the three-hour tour is offered with and without alcohol. Some of the other participating locations are Norman Rose Tavern, Ca’ Momi, Fatted Calf Fatted Calf Charcuterie and Anette’s Chocolates. The tour costs $90 per person with alcohol, $85 without. Surprisingly for Napa, wine pairings are not part of the tour. Her reasoning, Miller says, is she wants to spotlight the food without competing with Napa’s star beverage. Miller said she mixes in a little local history and culture with discussions of landmark buildings and events and trends that fueled Napa’s growth as a culinary mecca, and pointing out Art Walk sculptures along the way. She currently employs one other guide, and hopes to expand to Yountville and St. Helena at some point, she said. Other Napa tour versions are also planned. More information and reservations (required) are available at the company website, rootedforkfoodietours.com, or by reservation service at: 800-656-0713. While she continues her event management business – currently she is events manager for Festival Napa Valley and Appellation St. Helena – the food tour business has her heart. Miller said she wants to make her clients feel welcome.